Consider his range. No, not the distance from which he most consistently can pop in jumpers. Consider his range in the context of whether he will ever reach his maximum potential, his total capacity to perform on a basketball court. Julius Winfield Erving says he has considered his range in that context and has decided that he has a ways to go before becoming the best that he can be. But at the same time he says, that at this point in his career, he's already the best one-on-one player in the game striving to be even better. 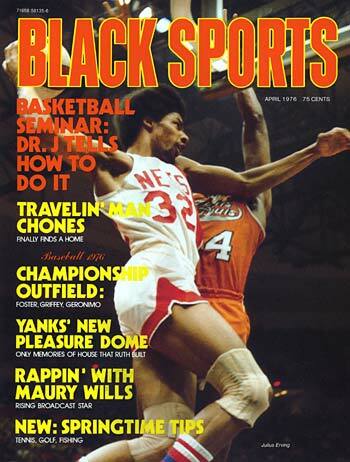 "Mentally your head has to be where you don't place limitations on yourself," says Erving of the ABA's New York Nets. "You never say I can't make the steal or I can't hit a three-pointer. You never deal with negatives. You never give up trying. Over the long haul that's the way good players are made." But most fans who have watched him play realize instantly that the man called Dr. J is far more than a good player, and much more than a flashy entertainer. On the court he looms as a stutter-stepping, high-leaping poet in short pants; a soulful artist, who seems capable of moving his audience with gyrations, surpassing the best of James Brown. Indeed, in his own way, he is a genuine genius of a performer. "In each game he shows me some-thing new," says Nets coach Kevin Loughery. "Look, there's nobody who can do the things with a basketball that Doc can do." 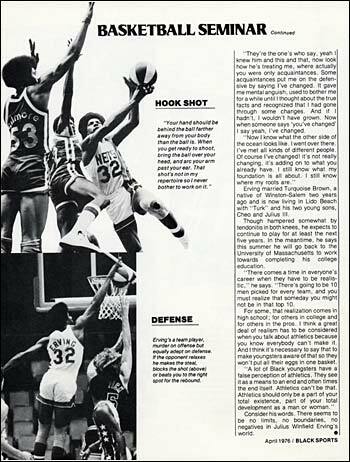 During his three years with the Nets, Erving has delighted the Nassau Coliseum fans with an act that includes variations on a dunking theme by Dr. J. He slam dunks with either hand or both hands, from either side or on a soaring down the middle drive. He often leaves his opponents leaning in the wrong direction and the crowd mesmerized with twisting lay-ups that would have puzzled Isaac Newton. At times, he has been observed scoring with his body suspended behind the backboard and his right arm extended beneath it, parallel to the rim. From that position he rolls the ball off his size-13 hand into the basket, then starts his descent, landing a few seconds before some fans can close their mouths. "Julius plays with such flair," says Lou Carnesecca, a former Nets coach, who now coaches at St. John's. "Yeah, that's the way I want to put it. Julius is more creative, more imaginative." "He's got the greatest potential of any forward I've seen," says Rick Barry of Golden State. "If he works hard he could be the best forward in the game." Erving sees his playing style as an integral part of his total development as a basketball performer. "I developed the dunk shot," he says, "because it was a challenging thing to learn to do. After you learn to do it one way, it's a challenge to learn to do it another way and right on up. There's an infinite number of dunk shots which i don't possess. And there are psychological considerations too. Dunking is a power game, a way of expressing dominance. It makes your opponent uptight and can shatter his confidence. "My style is an expression of me as an artist. If I develop an aspect of my game to the point where I can do certain things, why not do them? I would relate it directly to other professions like music and writing. Different people have different styles of expression. Shakespeare had a way with words so that they could be poetic . . . they just do it, that's them. The way I play the game, that's me. "And I wouldn't like to start feeling that I've done all that I could do and the coming years would be a matter of repeating what I've already done. I guess it's not such a bad thing to feel that I can repeat what I've already done, but that's not my goal, to do it over, do it over and do it over. I want to do it better and do it better. And I want to have fun too, and you can't have fun unless you're winning." His first season with the Nets was a definite fun year. He led the Nets to their first division and league titles, while capturing his second straight scoring title. He was also among the top 10 performers in four other categories: rebounding steals, blocked shots and assists. Erving and his teammates didn't have quite as much fun last season, losing both their division and league titles to the Kentucky Colonels. And though Erving continues to provide brilliant individual efforts this season (he was among the top five performers in seven categories at the All-Star game break) the Nets were second to the Denver Nuggets in the standings. He is completing the third of a seven-year Nets contract worth more than $2 million. In light of the ever-growing problems confronting the ABA (three teams had folded by January), Erving's value to the Nets and the remaining seven team league may be immeasurable. 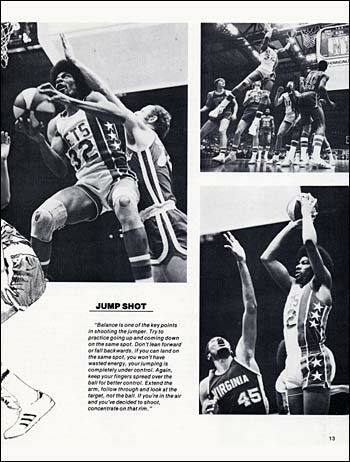 Half-jokingly, Loughery pinpointed Erving's overall value in an exchange with ABA official Wally Rooney during a game at the Nassau Coliseum. Erving, at his dazzling best, led the Nets to a 134-130 overtime victory over the San Antonio Spurs, scoring 51 points, grabbing 12 rebounds and adding eight assists. In the process, however, he took a physical pounding from Spurs rookie forward Mark Olberding. At one point, Loughery yelled to Rooney, "Hey look, the guy's killing Doc and you know if Doc gets hurt we can all pack it in and start looking for jobs. If anything happens to the Doctor the league goes down the tube." His opponents say Erving is so tough and so valuable because he is, in essence, a team player. Play him close on the outside and he uses his quickness to slip by. If he's covered underneath, he flips the deft pass to the open man for the assist. Relax on offense, and he makes the steal, blocks the shot or beats you to the right spot for the rebound. "My thoughts have always been aimed toward becoming a total player," he says. "I'm always trying to reach my outer limits. I watch the things other players do and try to imitate them. Then you have to develop your own thing through experience and practice. "You experiment all the time and develop your game individuality. You try all these different things and in trying, you make discoveries about yourself. You realize what you're good at and what your weaknesses are. Put enough time into it, then you'll be a true individual, an innovator, and people will take notice and the more gratifying it will be for you." His on-court flamboyancy contrasts sharply with his calm, almost cool off court behavior. He has maintained that seemingly unflappable demeanor ever since a family tragedy seven years ago. When he was a 19-year-old fresh-man at the University of Massachusetts, Erving rushed home one day and discovered that his 16-year-old brother, Marvin, had died of a kidney disease. They were very close. Beads of sweat form on Erving's nose now as he talks about his brother. He lowers his voice. "I cried all day that day he was buried," Erving said. "I went to the cemetery the first two days after he was buried and I cried each day. Then I went the next day and I didn't cry anymore. I realized I didn't have any control over what had happened. I haven't cried over anything since 1969, and I don't know what it would take to make me cry again. I don't have any fears. I'm not afraid of dying and for the most part, I play basketball without emotion. I guess that lessens the difficulty. That traumatic experience changed my life." Financially, Erving has moved from being a kid raised on welfare in a Hempstead, Long Island project to being a 26-year-old millionaire who will soon seek off the court privacy in a three-acre $100,000 home in Upper Brookville, also on Long Island. While his success has prompted an enormous change in his lifestyle, he believes his childhood value system, instilled by his mother, Mrs. Callie Lindsay, remains intact. "I've always been proud of myself for having common sense, knowing right from wrong and trying to do what was right," he says. "Those who were my friends, treat me the same. Like you grow up with a crowd of say 15 people, who you would hang with from time to time, and two of them are your friends. The other 13 you just grew up with. Erving married Turquoise Brown, a native of Winston-Salem two years ago and is now living in Lido Beach with “Turk” and his two young sons, Cheo and Julius III. Though hampered somewhat by tendentious in both knees, he expects to continue to play for at least the next five years. In the meantime, he says this summer he will go back to the University of Massachusetts to work towards completing his college education. “There comes a time in everyone’s career when they have to be realistic,” he says. “There’s going to be ten men picked for every team, and you must realize that someday you might not be in that top ten. For some, that realization cones in high school; for others in college and for others in the pros. I think a great deal of realism has to be considered when you talk about athletes because you know everybody can’t make it. And I think it’s necessary to say that to make youngsters aware of that so they wont put all their eggs in one basket. A lot of black youngsters have a false perception of athletics. They see it as a means to an end and often times the end itself. Athletics can’t be that. Athletics should only be a part of your total existence, part of your total development as a man or woman. Consider his words. There seems to be no limits, no boundaries, no negatives in Julius Winfield Erving’s world. In any discussion of his on-the-court expertise, Erving always emphatically stresses the importance of learning the fundamentals before moving into the more complicated levels of his game. 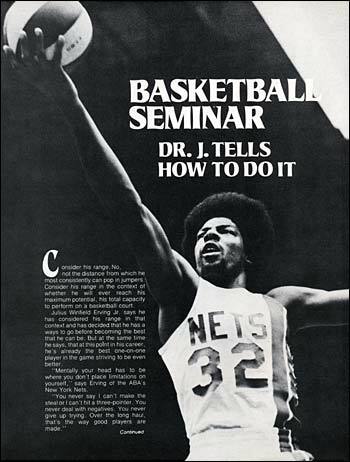 Here are a few fundamental techniques, endorsed by Dr.J. "The main dribbling is to handling the ball without looking at it. While you're practicing to dribble, look at anything besides the ball. Then you try to establish a rhythm. There should be one pace you should master. Then go faster or slower depending on the situation. Becoming a good dribbler comes with practice and experience. And it's important to use your fingertips while dribbling. Spread your fingers out as far as you can. Try not to dribble with your palms or your wrists." "From the right hand side of I the basket, you want to shoot with your right hand and take off with your left foot. From the left side you want to do just the opposite. You don't want to be watching the ball i on a lay up. Keep your eyes on the backboard and the rim. You know where the ball is because you can feel it." "Balance is one of the key points in shooting a jumper. Try to practice going up and coming down on the same spot. Don't lean forward or fall backwards. If you can land on the same spot, you won't have wasted energy, your jumping is completely under control. Extend the arm, follow through and look at the target, not the ball. If you're in the air and you've decided to shoot, concentrate on that rim." "Your hand should be behind the ball farther away from your body than the ball is. When you get ready to shoot, bring the ball over your head, and arc your arm past your ear. That shot's not in my repertoire so I never bother to work on it". Erving's a team player, murder on offense but equally adapt on defense. If the opponent relaxes he makes the steal, blocks the shot or beats you to the right spot for the rebound.